Today the littles and I, after a day of decorating, learning how to do new things, and organizing around the house, traveled up to a place I love and saw one of our favorite folks do something new too. We went up for my Aub’s Washboard Band performance at Wesleyan College. She has played her guitar in public before, but this was her first time playing the cajon with a group. She did well, not that I was surprised, I guess, but it was good to see something come out of the year of percussion lessons way back during our first year of homeschooling when she was in the eighth grade. I enjoyed every moment. The rewrite of the Twelve Days of Christmas, Wesleyan style, was hilarious and yet it rang so true. It reminded me of the stress and anxiety of this time of year for students. If you know one, especially a college student, hug them. And then feed them copious amounts of chocolate and put a fiver in their hands just in case they need a little more later. Bless them. My college student alone has two finals, a big paper, and a presentation all coming due in the next week, and she’s not even done attending classes, not to mention her job. And this is NORMAL for a college student. Hug ’em, y’all. It’s hard. They can do it and do it well, but when you’re in the midst of it, it can make you crazy and make you doubt yourself. As we were leaving, we drove the long way to leave campus, and this stopped me in my tracks. And made me smile. I love the geese. I mean, I always leave a respectable distance between them and me, but I do love them. Our Princess rolled down her window and wished them a Merry Christmas, which was–well, so her. Precious. Yes. Those are the ginkgoes I love so much. A beautiful sight. My future Golden Heart said, “Oh look, that’s Golden Heart snow!” A Wesleyanne through and through. I don’t think she’s quite ready for college yet. But that’s okay. She’s got years to go yet. And I’m sure they will fly by. Wishing you all a moment or twelve of peace in the midst of the chaos, no matter what your chaos might be. And if that can’t be found–chocolate. And lots of it. Last night I had the great pleasure of combining four of my favorite things all in one evening. Such beautiful, raw energy in these poems that hasn’t let go of me yet. The more I thought about the poems, the more I longed to be in the audience, listening to this artist share her work. The Fella was more than willing to hang out with the littles, so I hopped in the vehicle and went. Not a whole of lot planning happened beforehand which is probably the only reason it was able to happen. My girl and I met for supper with her best friend and her parents. Two words. Fish tacos. We bundled up in the cold and made the five-minute trek over to Taylor Amphitheater where the poetry reading was to be held. I’ve sat in that room many times over the years, but last night topped it. Anya Silver is a weaver of words. She writes about the raw emotion that comes with a cancer diagnosis and about what it’s like as a Mama loving her child. The poem about her son’s legs…..beautiful and delightful. And I completely got it. What impressed me perhaps even more than her writing and her easy reading of it was her grace. One young woman in the audience asked a question that had just been asked a few minutes ago. Without ever making the person questioning feel uncomfortable or any of the rest of us for that matter, Dr. Silver answered it again briefly and then delved into a little more in-depth thought on the subject. After she finished reading, Dr. Silver graciously met with people who wanted to purchase books or have their books signed or just visit for a few minutes. I wound up toward the end of the line, and while my mind was starting to wander back to the Fella and my littles and their getting ready for bed routine (okay, I was missing them), I wanted to stand in that line and meet this woman who could elicit such emotion from me with her words. The lady in front of me did not have children to go home to. She was elderly, and from her conversation with the poet I wondered if she were going home to an empty house where the only sound would be the sound of her own feet brushing the floor with each step, where the only fire she’d warm herself by standing close to would be one she made herself. I wondered who listened to her stories when she was sitting in her home, presumably alone. I hope she has a dog. Or a cat. Because she had such good stories. She carried on a conversation such that I thought they’d met before and were good friends, but eventually I figured out that was not the case. And again I was struck by the kindness and grace of the one signing the books. When we moved up to meet her, sitting there next to her little guy, 10, who was reading an Encylopedia of Presidents that Cooter would have loved to peruse, I introduced myself and Auburn. I too launched into sharing a bit of my story, our story. On the way home, I laughed at myself. I had done just what the precious lady in front of me had done. Carried on a conversation as though we were old friends. And I wondered, do we feel the need to do that because she has just shared some intimate and deep and personal stories about herself? Now we want to do that as well? Or was it that her stories took us to a place where we were comfortable with her and comforted by sharing our own? I don’t know. But it happened. She answered my questions graciously, and I know some of the answers will change me as a writer. As a writer of poetry too. But I left there with one question unanswered. How do you write the raw and broken so well and be okay with putting all of that into words and putting it Out. There. ? Because I have some thoughts that long to come out, but I’m not ready to open that Pandora’s box yet. Last night was an amazing evening. And while I missed the rest of the crew, it was absolutely one of those moments I will pull back out and thumb through over and over again when the nights are long and cold and dark. 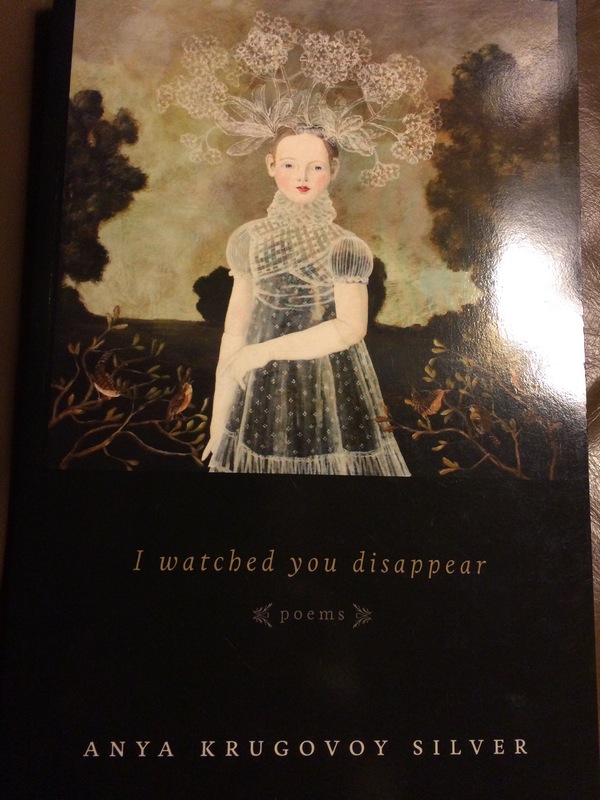 There was so much light in this experience–and sitting there next to my girl at OUR alma mater, listening to stories that resonated with us both…..
Tonight I’m thankful for my writerfriend who introduced me to Anya Silver’s poetry. I am thankful that Dr. Silver is willing to share her journey and not pull any punches. We need to hear the truth–I think we even crave it sometimes. I appreciate the Fella’s gift to me of time, and I love my littles for making the evening a good one with their Daddy. Whenever you have a chance to hear someone who has created something/anything share about it–GO. Go and listen. Go and taste. Go and sense every wonderful feeling you can. Because that opportunity might not ever roll around again. And seeing the poetry through the eyes of her story that she let us see–that only made the poems more powerful. More heart wrenchingly beautiful and achingly divine. Poetry is a beautiful art, and it changed me a bit to go and hear such a gifted writer share her story last night. It also scared the bejeebies out of me if you want to know the truth. I have such a long way to go, but the path is filled with beautiful people along the way who are willing to share what they know and what has worked and what didn’t. I just know I want to go down that path. May you all have someone share their story and it lead you down the path of where you are supposed to go. And may you come across a poem that takes your breath away or makes you laugh or cry or reach out to someone else with love. Or go read an Anya Silver poem and you’ll find yourself doing all of those things. did they see her tired eyes? did they welcome the gift of her smile? did they see more than an employee in front of them? did they see the girl? This weekend marks 23 years since I graduated from college. I don’t think of it every year, but for many reasons, this year it’s been on my mind. It was four years before that I spent a week choosing between Wesleyan and Georgia Southern. Yeah, you don’t get much more polar opposites that those two, do you? Coed vs. all women, small vs. large, close to home vs. a few hours away, and so on. I had a leaning towards Wesleyan because it was closer (seriously, that long drive with Daddy for Scholarship Interviews at Southern was very possibly a deal breaker–there was nothing on I-16! ), and because Mama had graduated from there four years earlier. Mama only had two quarters left in college as a Chemistry major at Valdosta State when, as a first year bride and newly pregnant, she was told by doctors it was either the degree or me. She chose me. With only two quarters left. I am humbled and thankful. So in 1980, she transferred her credits to Wesleyan and changed to a Psychology major. I remember her music class with Dr. Herrington. She came up with neat mnemonic devices to remember the composers–“Mozart’s in the closet! Let him out! Let him out! Let him out!” My brother went to the little preschool at the edge of campus while she was in class, and when we were out of school, we would go and sit in an empty classroom across the hall from hers. I remember sitting in the brown desks, dreaming of the day I would go to college. It seemed so far away then. Because Mama was on campus regularly, she learned of things like the children’s plays and the Naiads–the synchronized swimming team. We went to the theater for the plays and for concerts. We watched the swimmers in their beautiful suits dancing in the water. I suppose it was only inevitable that Wesleyan won in the choice of college; she had already won my heart. I was home. 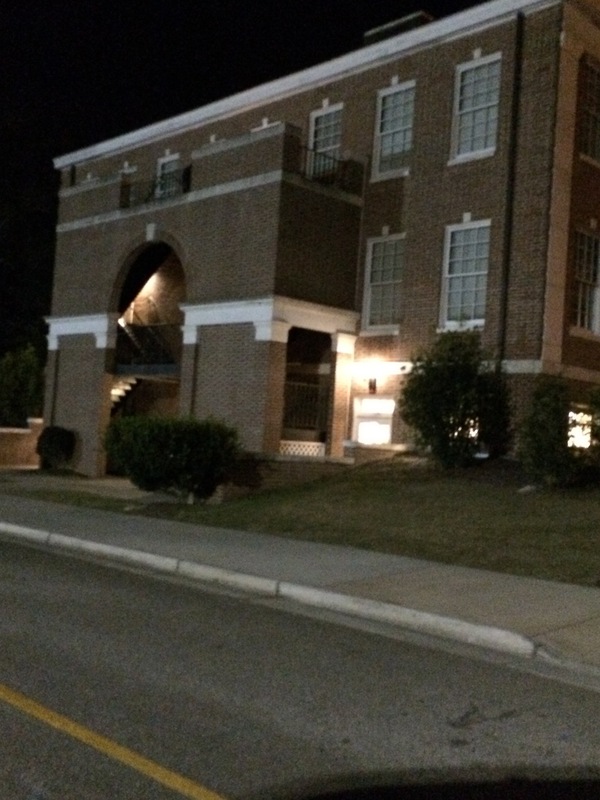 I made great friends during my years at Wesleyan, and I figured out what I believed. I loved the classes and assignments that made me stretch myself and explain what I believed and why, especially the papers for Dr. Ledbetter’s classes (my favorite may have been on the spirituality of Madonna’s “Like a Prayer”). Because I attended only four years after Mama, I had Dr. Curry for Psychology just as she had. My freshman roommate helped me bind my children’s book for Miss Munck the night before it was due. (I still have it.) We had a gummy bear throwing “thing” going on with our across the hall neighbor. (Some things you don’t ask about, people.) I may or may not know something about a vehicle driving across the sidewalk to get its occupants to Physical Science on time, because they had been watching the last few minutes of Y and the R. As a Resident Assistant, I found great friends in the classes behind ours. And I collected a great deal of purple paraphernalia over the years, as I was a Purple Knight. Wesleyan was where I learned to accept others, no matter our differences, and to accept myself. This is also where I fell in love with the theater, and I was thrilled when Sir cast me as the lead in the children’s play my junior year. I was going to be on stage performing for excited children, just as those actresses had when I was younger. What a blast I had! I learned that time management was important (we don’t talk about Calculus II–EVER), and that laughter truly is the best medicine. 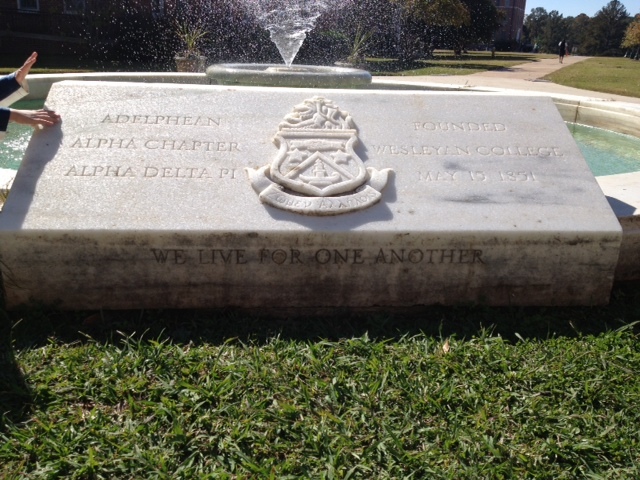 I was thrown in the fountain for my birthday each year, and twelve years after graduation, I was married around the fountain which has the words “We Live For One Other” etched in the marble. The fountain at Wesleyan–so many memories. This year I suppose the memories of my years–was it only four?–at Wesleyan are especially poignant, as this is the year of the passing of the torch. As I sat with my older daughter on Scholarship Day, I wondered if she would choose my alma mater. I only wanted it for her if she felt like I had–that it was home. I had my answer very soon. Scholarship Day was Saturday, February 9th. It was the evening of the 10th that my dear friend, minister, and sister Wesleyanne brought Aub to the hospital to say goodbye to Mama. Aub walked in, went straight to her bedside, and said, in a voice that was somewhat tremulous and strong at the same time, “Maemae, I decided about college. I’m going to Wesleyan.” I was in tears (and yet I thought–wait–we haven’t heard about the scholarship yet!). It was the day after Mama’s funeral that Auburn’s Admissions Rep, also a Wesleyanne and a fabulous woman, called her and gave her the good news. Auburn is the newest recipient of the Mary Knox McNeill Faith and Service Scholarship, and a member of the Pirate Class of 2017. My Pirate, Class of 2017! My girl has embraced her choice and never looked back. (As she was born on National Talk Like a Pirate Day, I suppose it was inevitable.) She is a strong woman, that one. I give thanks for that. She joined every Wesleyan related Facebook page she could. She has friended former and current Wesleyannes. She talked me into going back for STUNT–the awesome production that took up much of my life my junior and senior years. 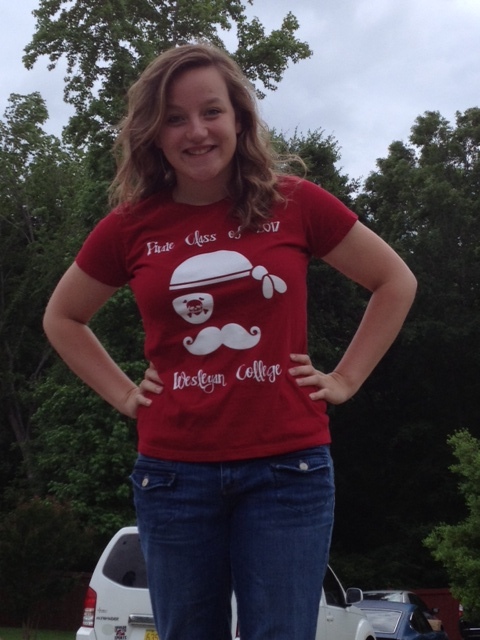 She even participated in a contest to design the t-shirt for the incoming freshman–and her design was chosen. Not too shabby for our future Graphic Design/Psychology major. The noblest, the greatest, in all this fair land. A fountain of knowledge, the oldest and best. Forever and ever thy glory shall last. True, faithful, and loyal, dear Wesleyan to thee. As she stands around the fountain under a star-filled sky, arms joined with her Pirate sisters, the sound of their voices raised in song filling the night air–for just a moment, I hope she will look up and think of those who have gone before, and all that lies ahead of her. And I hope, in that moment, she will smile. And dream big dreams. Like I did 23 years ago. Go get ’em girl. Pirates, all the way!